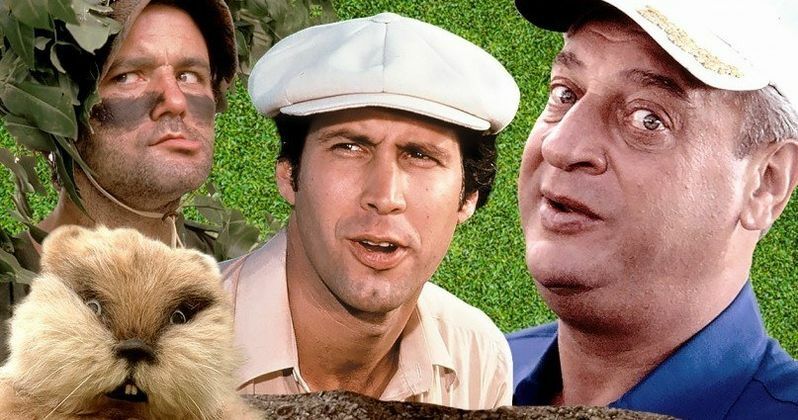 The Caddyshack Fest is set to make its debut in the summer of 2019. Will Russell, cofounder of Lebowski Fest, was sitting around thinking about creating another festival that centered around sports, and thought of the 1980s cult classic, which starred Rodney Dangerfield, Chevy Chase, and Bill Murray. Lebowski Fest, which celebrates the Coen Brothers' cult classic The Big Lebowski, started in 2002 and has become a huge event over the last 16 years, attracting many of the actors in the film, including Jeff Bridges. Creating a new festival isn't an easy thing to do, but after the success of Lebowski Fest, Will Russell has a head start. However, finding the right movie around the right circumstances can be a bit hard. As it turns out, all it took was a discussion with a friend that led all paths to the new Caddyshack Fest. Russell explains. "Bowling really ties Lebowski Fest together. It's great to have an activity. I was like, What's another movie that has an activity? Caddyshack! It's a f*cking great movie. It's hilarious. It's so quotable, just like Lebowski. I'm hanging out with my friend Matt Davis, and he's always quoting Lebowski and Caddyshack, and I was like, Dude, you want to do this Caddyshack Fest with me? And he was like, Yeah, man! Let's do it!" Bowling is something that really does help bring The Big Lebowski Fest together every year, so thinking along the lines of another sport is a really great concept, which is sure to bring out fans of all ages. Will Russell puts on the Lebowski Fest in Kentucky, and the Caddyshack fest will do the same. Russell had this to say about what fans can expect at the first year of the fest. "We drove out to this golf course in Louisville, and this place is perfect. We're going to have golf cart races and costume contests and a dance party. It's going to be just a blast. We published the Facebook page today about 3 p.m., and last I looked it had about 200 followers already, so I think it's going to be a huge hit. A portion of the proceeds will go to benefit (the mental health non-profit) Everything Will Be OK Project." The interview was conducted with Will Russell over the weekend and the Caddyshack Facebook page now has nearly 500 followers as of this writing, leading one to believe that Russell hit the nail on the head yet again. As for stars of the film coming out to the fest, Russell says that they want to get Bill Murray out, which could very well happen since the comedian/actor is such a huge fan of golf. Chevy Chase probably wouldn't come out, even if he was asked, but stranger things have happened. Even getting Bill Murray out to Caddyshack Fest seems like a long shot, but Will Russell says that Murray's son just became a basketball coach at the University of Louisville. This obviously doesn't officially confirm that Murray will make it out, but the actor has gone out of his way to surprise fans over the years, and the Caddyshack Fest seems like the perfect place to play some golf and shock some fans. You can read the full interview with Will Russell about his upcoming Caddyshack Fest over at Entertainment Weekly.